Why White rose restaurant (Nha Hang Bong Hong Trang) is special ? What is Hoi An White Rose? According to the local people, White Rose has been long time ago.From the 17th century, when French reporter came Hoi An and enjoy it. He felt that its flavor was delicious, strange and its shape like Rose( a kind of flowers) and White was the color of these cakes. 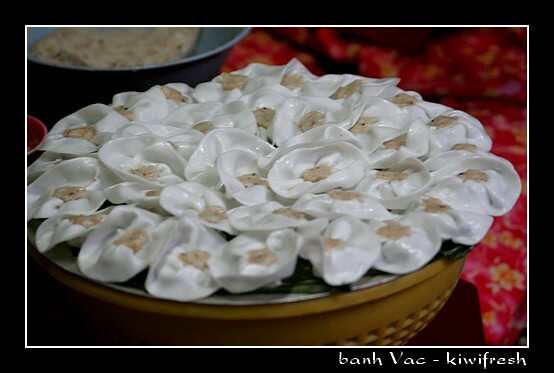 Known locally as Banh Bao Vac, the name ‘white rose’ was apparently given by the French. When examining the Vietnamese dish closely it’s easy to see how they came up with the name as the outer section certainly could resemble flower petals. The little dumplings are made from translucent white dough which is filled with spiced minced shrimp or pork, and bunched up to look like little white roses. The recipe for these dumplings is secret, held by one family in Hoi An who supplies all the restaurants. At 533 Hai Ba Trung Street, Tran Tuan Ngai is a third generation secret keeper of the traditional white rose recipe. Prices are very cheap for such good foods. It's located at 533 hai ba trung, its a little bit out of the city area but well worth the walk! Saw this place promoted in gourmet traveller, they only do 2 dishes, wontons and white rose - both are delicious. At 533 hai ba trung, its a little bit out of the city area but well worth the walk! An American expat recommended this to us as THE place to get Hoi An's local specialties, white rose and fried wontons. It's several blocks out of the tourist area, well worth the walk. Our waitress gave us the menu with the comment &quot;2 foods only,&quot; we ordered a plate of each and enjoyed both of them. (Sorry, we devoured the wontons without taking a picture!) She came by our table to show us how they form the white roses by hand; this family-owned restaurant supplies many others in the area. The two platefuls of food were ample for two adults, and our bill came to about $10 including a juice and a beer. We had fried wontons later during our trip, but these were the best. An American expat recommended this to us as THE place to get Hoi An's local specialties, white rose and fried wontons. It's several blocks out of the tourist area, well worth the walk. Our waitress gave us the menu with the comment "2 foods only," we ordered a plate of each and enjoyed both of them. (Sorry, we devoured the wontons without taking a picture!) She came by our table to show us how they form the white roses by hand; this family-owned restaurant supplies many others in the area. The two platefuls of food were ample for two adults, and our bill came to about $10 including a juice and a beer. We had fried wontons later during our trip, but these were the best.